Would anyone be interested in meeting up Sunday morning of NDK? Re: NDK Colorado Sunday Meetup? Just a polite reminder: if people want to set up a common location folks can drop by, that's one thing, but please don't solicit contact information. 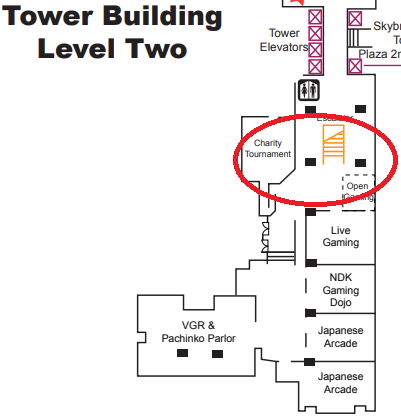 How about we all meet at the top of the escalator in the 'tower two' building at 8am Sunday morning for some worship/Christian meetup. This is where all the gaming events are. There are usually open tables and plenty of seating in this area (and at the very least floor space). i waited around for about 30 minutes at one of the Charity Tournament tables. It turns out that at 8am that area is completely empty! That being said, I will keep this as a meeting spot for future NDKs. Maybe if this post stays up for a year then it will gain some more attention.